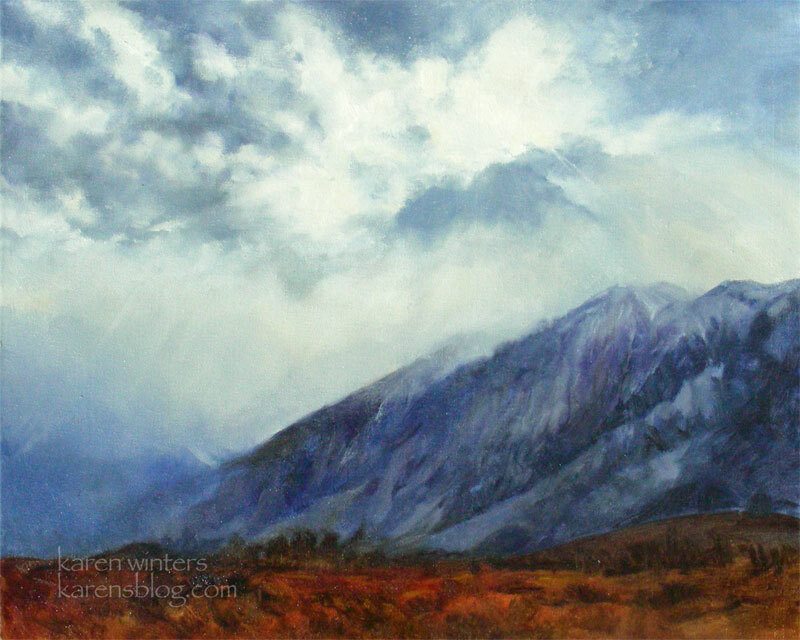 This is one of my favorite new paintings inspired by our High Sierra trip, and it represents a view of the Sierras in the afternoon, not far from Crowley Lake. In the afternoon, when a storm is in the air, the clouds hover around the top of the mountain to be backlit by the sun. The effect is nothing short of spectacular and truly expresses a feeling of spiritual joy. With that in mind, as I was searching for a title for this, I remembered a line from the Christmas carol, “Joy to the World.” The refrain is “and heaven and nature sing …” Being there and seeing this magnificent mountain crowned with light, I truly felt that heaven and nature were singing. So there you have it. The most challenging part of this painting, to my surprise, was not painting the clouds and the light – it was defining the many gullies and ridges, all in deep shadow, that decorate the eastern slope. The values are very close but there needs to be enough definition for the eye to read it as a sculptured geological form … but not SO much definition that it appears that the shapes are light-struck. So much in that area has to be suggested rather than spelled out, lest it lose some of the air of mystery. And *that* is a constant challenge. This painting will be among the select group of new works that I’ll be taking to Descanso Gardens on Friday morning for our Encore year end show. So if you are in LA and want to see it in person, that’s where it will be. If you are out of town and wish to purchase it, please let me know and I will replace it in the show with another of my recent works. Wow, this is beautiful. I was up in the high country of Yosemite in mid-October, and it was just stunning. You captured it wonderfully. I also enjoyed the book, Obata’s Yosemite. He was a Japanese American who went up in the high country for 2 months in the late 1920’s. He painted all day every day, and came home with 100 paintings that blend West with East beautifully. Your work reminds me of him. Wow – this is one of your best (and that’s saying a whole lot!) Absolutely you have captured those special times in the high sierras (my ultimate favorite place in our beautiful state). You may have found the gullies to be challenging, but you met that challenge. . . in spades!! I honestly don’t see how this could be any better. My goodness, this is beautiful and sooooo realistic! I love that you do so well. I really really like this one – beautiful! You’ve got the balance just right. Wow this one really caught my eye as it came across my reader. Hello,Its very very nice and wonderfull. OMG this is beautiful! Perfect title too. That is GORGEOUS! So, so beautiful. Wow, Karen, this is gorgeous! Thank you for sharing the story behind this beautiful painting and the challenges you faced. You are an inspiration! Karen, that’s the perfect title for this painting. It really does sing! Beautiful! Somehow I missed this earlier! It’s gorgeous Karen…. love the clouds on this one. and the blend with the mountains. really amazing. brillaint. « Santa Barbara Glow – oak tree painting in acrylic.